The trajectory of the United States’ conflict with al-Qaeda continues to echo U.S. foreign policy during the early part of the Cold War. Last week U.S. President Barack Obama gave a wide-ranging speech on counterterrorism where he pledged to reduce the intensity of America’s operations against al-Qaeda and its affiliates. If he is able to successfully implement his agenda, it would mark another turning point in the U.S. war on terrorism that closely mirrors the trajectory of U.S. foreign policy during the Cold War. The initial U.S. posture during the Cold War was to deny that one existed at all. Indeed, President Harry Truman took office determined to follow his predecessor’s post-war vision of the U.S. and Soviet Union cooperating closely as part of the four global policemen. Truman would continue to pursue this policy even as the Soviet Union’s ambitions became readily apparent. Thus, the inexperienced president would order the fastest demobilization in U.S. history even as Moscow devoured Eastern and parts of Central Europe, and clearly set its sights on other areas of the globe. It would take a number of dramatic events coinciding before the U.S. was completely woken from its slumber. Specifically, the first signs of containment began emerging in 1947 after Stalin’s designs on Turkey became difficult to deny in the second half of 1947. Truman’s overextension quickly followed beginning in 1949 when Mao’s forces emerged victorious in the Chinese Civil War and the Soviet Union tested its first atomic weapon, which led the Truman administration to begin drafting NSC-68, drastically expanding the scope of containment. This trend continued when Kim Il-Sung invaded South Korea the following year. Despite having stated unambiguously that South Korea was outside the U.S. “defensive perimeter,” U.S. forces would intervene not just to save South Korea from communism but later also unify the entire Korean Peninsula. Meanwhile, in Congress Joseph McCarthy began his infamous witch hunt of Soviet sympathizers in the U.S. government and society. Just how dramatic of a swing this was in such a short period of time was well illustrated by George Kennan. 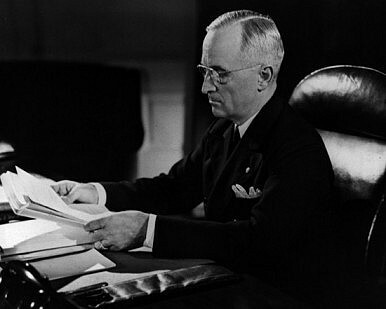 In the initial years of Truman’s tenure, he had been more hawkish than most senior administration officials in advocating for a containment strategy against the Soviet Union. Yet, only a couple of years later in 1950 Kennan quit the State Department in opposition to the hardline stance the Truman administration adopted following the events of 1949-1950. Kennan’s concern over American overstretch were well-founded as became evident after the UN-led forces in Korea crossed the 38th Parallel and continued heading North, prompting an intervention from the Chinese. The American people soon lost their appetite for large military interventions after the UN forces retreated back across the 38th Parallel and the war became bogged down. Thus, Dwight Eisenhower was elected president in 1952 running on a platform to end the Korean conflict, which he would do over the next couple of years. At the same time, to battle the Soviet threat he initially relied on America’s technological advantage in nuclear weapons, aggressive covert action run by the Central Intelligence Agency, and the strengthening of allied forces particularly through rearming West Germany and integrating it into NATO. Throughout his eight years in office, Eisenhower only once deployed American forces on the ground in a conflict zone (Lebanon) and quickly withdrew them. He also refused to intervene in other contingencies like Egypt and Indochina despite allies’ pleas. Later in his presidency, however, Eisenhower became more wary about using covert action so frequently and aggressively, and recognized the country couldn’t rely on a massive retaliation strategy indefinitely, given its moral implications and the Soviet’s likely closure of the technology gap in nuclear arms and missiles in about a decade’s time. He also sought negotiations with the Soviet Union and continued to resist heavy domestic pressure from individuals like Senator John F. Kennedy to re-militarize America’s Cold War strategy. Indeed, his last speech as president was dedicated to the dangers of doing just that. America’s response to al-Qaeda’s emergence has unintentionally followed an eerily similar trajectory. Osama bin Laden’s declaration of war against the United States in 1996 barely registered inside the U.S. government. Its 1998 attacks on U.S. embassies in Africa only piqued President Clinton’s attention briefly, with real concern only developing among him and his senior aides after the attack on the USS Cole in 2000. Indeed, with the exception of the missile strikes in the immediate aftermath of the 1998 attacks, Clinton still refused to authorize operations to eliminate bin Laden if there was almost any risk of civilian casualties. Late in Clinton’s second term his administration also launched a new public relations campaign depicting Saddam Hussein as the greatest threat to U.S. and global security. Any interest the Clinton administration’s senior policymakers had developed about al-Qaeda in the final days of their tenure did not carry over to the George W. Bush administration, much to the chagrin of the counterterrorism holdovers at the National Security Council. The 9/11 attacks rightly reversed this neglect of al-Qaeda. As early as the night of the attacks, however, Washington began to drastically overreach to the threat, when George W. Bush declared a war against anyone who commits terrorism or harbors those that do instead of against the adversary who had just attacked the U.S. homeland. Starting from this definition of the problem his administration launched two massive wars and vastly expanded the size and authority of the national security organizations inside the U.S. government. Much like Korea, however, the wars in Afghanistan and Iraq quickly soured the American people on war. Thus, by the time Obama succeeded Bush in 2009, a new more sustainable approach to counterterrorism was clearly needed. Even as he launched a surge of troops in Afghanistan (with a defined timeline for withdrawing them) Obama, like Eisenhower, quickly began prosecuting the war against al-Qaeda largely by relying heavily on America’s technological advantages and more aggressive covert operations run largely by the CIA. Alongside these efforts, the White House has redoubled efforts to better train security forces across the globe, while remaining inherently hesitant to commit U.S. forces to new military conflicts. Despite the undeniably success of this strategy so far, the Obama administration is worried that it will eventually face blowback from its actions and therefore hopes to rein itself in. This is prudent strategy but it remains to be seen whether this attempt will succeed or, like the U.S. during the 1960s, Washington will unnecessarily re-escalate its campaign again.